The manager of one of the UK’s biggest waste treatment facilities has returned to Manchester following a “disturbing and depressing” fact-finding tour of a notorious African municipal rubbish dump dubbed the ‘Mountain of Death’. Jen Cartmell, who manages waste management company Cleansing Service Group’s (CSG) award-winning industrial waste treatment and recycling centre at Cadishead in Salford, visited the toxic 30-acre open dump at Dandora on the outskirts of the Kenyan capital, Nairobi. She was there to see how money raised through a recycling scheme at the CSG site was being used to help children forced to scavenge through the African dump in search of food and saleable recyclables. International condemnation forced the Kenyan authorities to close the dump in 2008, but it is still in use and remains the only source of income for impoverished local residents, including very young children. A United Nations Environment Programme research team found that almost half the children working there were suffering from high levels of sickness. Part of the proceeds from CSG’s new recycling plant at Cadishead, where plastics, wood and cardboard which formerly went to landfill are now being sorted for reuse in a range of industries, are being donated to the Tent of Refuge, a charity providing food, games equipment and school fees for the Dandora children. Few westerners have visited the dump, which is controlled by gangs and considered unsafe, but Jen toured the site with charity workers. “It’s pretty shocking – literally piles of rubbish which are the source of income for many people. People actually live on the landfill, eating food off the tip. When we reached the active tipping face where lorries still tip their loads there were more than 100 people, men, women, girls and boys, all sorting through the rubbish to pull out recyclables to sell. “We met grandmothers who had been collecting recyclables all day to make enough money to put their grandchildren through school, and visited homes, sometimes just tin shacks, where people were living off dumped airline food. 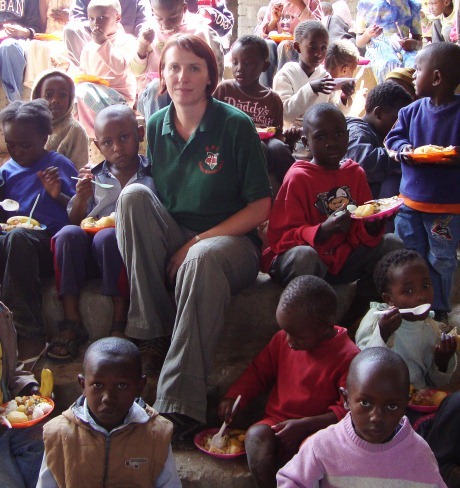 The Tent of Refuge charity is doing wonderful work for the children. It opens every Saturday morning and around 150 children are fed and get the chance to play games and sing songs which is what they should be doing. The charity also pays the fees which enable many of the children to go to school.